Immediately upon arriving at my sister's house last week, I repacked for a holiday at the beach. That means I took a quick shower (in cold water), changed into my last remaining mostly clean clothes, and threw a portion of my dirty laundry into my day pack. The six of us and our luggage (some members of my family brought more than a day pack) hopped into a white VW bus (called a combi here) and drove off down the coast to Porto de Galinhas, a little tourist town on the beach. My sister tells me the galinhas in the Porto de Galinhas used to refer to slaves, that Porto de Galinhas used to be a major port of entry for this kind of galinha. (I'm not sure why slaves would be called galinhas (chickens) though, since those were the days when chickens roamed free.) However, the local tourist industry apparently decided that this etymology wouldn't be good for PR, and so now the galinha references you find there are giant wooden carvings of chickens, all over the town, and bug-eyed chickens on t-shirts, yelling "NO stress!" and other endearing slogans. We rented a little chalé in a pousada for three nights, a few blocks from the beach, with two bedrooms, two bathrooms, two floors, and two front doors. There was also a single winding staircase, a kitchen and a couch. Mum and Dad slept in one room, and the four of us kids slept in the other. 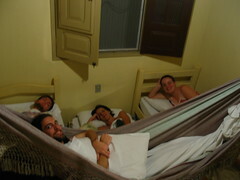 With the four of us, the mosquitos, and the flying ants, it was very cozy. Pinker got kicked many times during the night when one of us others turned over. There were several times in the chalé that I opened some musty cupboard or walked into a room and had a feeling of deja vu, taking me back to the Zander house, the last house we lived in in Colombia. Of course, the chalé was much smaller, and was in some ways nicer, with tile floors rather than cement, and smells of ocean rather than views of the lake. But somehow it was similar too. 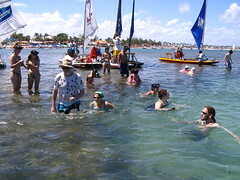 The main attraction at Porto de Galinhas is the reefs. At a particularly low tide, the reefs just off shore stick up out of the water, creating tide pools with tropical fish trapped inside. We were there near the half moon, so the tide wasn't so low, but it was still low enough for us to walk around on and watch the fish. We also spent a lot of time by the pool, on the couch, eating, or wandering the tourist shops. 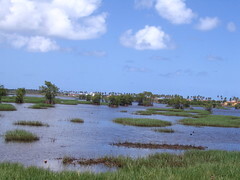 On the way out, we made a wrong turn and ended up driving along a dirt road through this estuary. It was almost like a jeep ride to Port. Thank you for clearing that up. I thought the galinhas was a reference to the prickly, pasty white legs of the beach-going tourists.